Packs to 5"w. x 9"l.
10"w. x 20"l., 7 oz. Packable comfort for your next snooze under the stars. Packs down to just 5" x 9", yet delivers big comfort for camping, car rides, air travel and more. 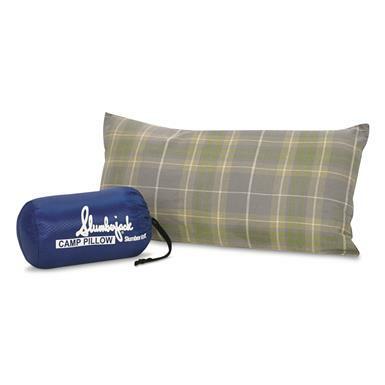 Packed dimensions: 5"w. x 9"l.
Slumberjack Slumberloft Camp Pillow is rated 2.5 out of 5 by 2. Rated 1 out of 5 by Joe J from Waste of money this pillow is a waste of your money. It is too small and thin for camping and totally useless In a car. You would be better off just wrapping up your jacket or a hooded sweatshirt putting it under your head. Rated 4 out of 5 by Wmmichael20 from Works well Have had this pillow since 1999 and for such a small product it works well and makes a huge difference in your nights sleep! No more pain in your neck.